The Asian Development Bank, in collaboration with the government of People’s Republic of China, held a workshop on Urban Adaptation to Climate Change on the 5th September 2014 in Beijing. The workshop brought together representatives from local governments and other DMCs from Asia and Pacific to share knowledge and expertise on urban adaptation and discuss the smart way forward to integrate climate change adaptation deeds into urban development plan and facilitate the climate change investment. 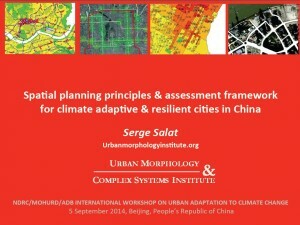 During this workshop, Serge Salat presented an integrated approach to address urban resilience in China, resting upon 8 spatial planning principles. Chinese cities have changed more in the past thirty years than they had in five thousand years before. They are at the front line of a changing climate. They account for more than half of the country’s population, most of its economic activity and the majority of its energy-related emissions. Most of Chinese cities above 5 million and two of its main metropolitan regions are located in the low elevation coastal zone. Rising sea level, storm surge flooding, higher frequency and intensity of natural catastrophe could have widespread effects on populations, property and ecosystems, presenting threats to commerce, business, and livelihoods. The role of Chinese cities in reducing risks and protecting their inhabitants is central to effective climate resilient policies. Adaptation must be included in planning of new cities and in retrofitting of existing cities. Urban spatial planning is a holistic approach for local communities to capture synergies between emissions reduction and adaptation, as well as sectorial and broader sustainability co-benefits. Creating climate resilient cities implies defining planning rules that allow for future evolution and adaptation to non-predictable conditions. Chinese spatial planners can increase climate resilience of cities by following 8 key principles derived from international best practices, from lessons of historically adaptive resilient cities, and from the general laws of ecological resilient systems. Climate resilient cities can adapt to the increase in the likelihood of weather-related natural disasters, such as floods and drought, or storms. Most of Chinese cities above 5 million and two of its main metropolitan regions are located in the low elevation coastal zone, which are areas with potentially high risks. Energy resilient cities are highly adaptive to increases and/or fluctuations in energy prices. Energy resilient cities are on a low dependency path to energy. The fact that Chinese cities in the process of fast urbanization are lacking developing time does not imply that they should be conceived as top down blueprints. Climate resilient cities must be nurtured as gardens, which will naturally grow and transform for centuries. Living systems, because they developed and became more complex over four billion years of evolution across many climate changes of an intensity far superior to the present one, are the best model for defining climate resilient cities. Evolution permitted the survival of species through constant transformations. In cities like in ecological systems, connecting and differentiating are evolution forces that act to create, through emergence, efficient and resilient urban structures. Resilient cities are highly structured wholes. They present differentiation, connectivity and structure at all scales. 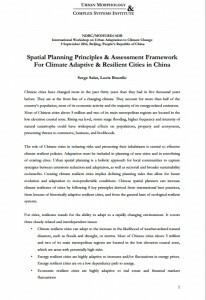 For more details about this workshop and these 8 spatial planning principles for urban resilience in China, two documents are available for download: the presentation and a working paper.